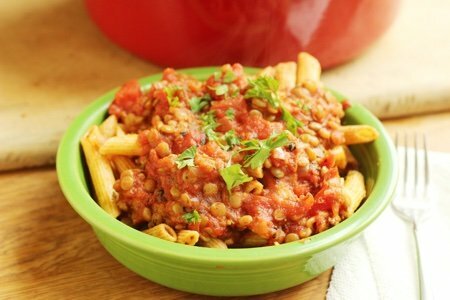 Lentil Pasta Sauce: Zero Points! 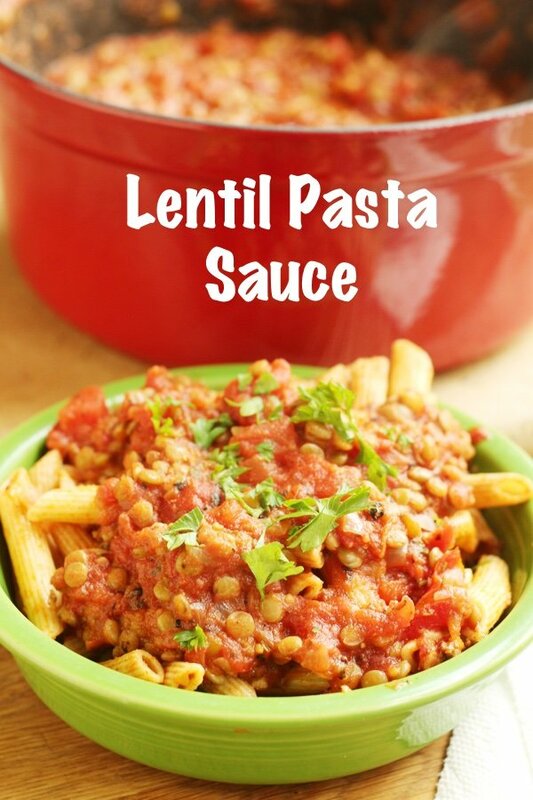 This lentil pasta sauce is my kind of recipe. Delicious, inexpensive, and it can be served on just about anything. Why use lentils instead of ground beef? They are a fraction of the cost and most of the flavor in tomato sauce is due to the tomatoes. You don’t really need meat (though I do admit that meat is quite luxurious). It is far better for the planet to eat lentils so you get a win-win. You spend less money and you stop global warming. YES! My daughter went vegetarian last year so I have been making all of the family favorites without meat. I actually like this sauce better than a typical Bolognese because it is lighter and doesn’t weigh down my stomach. I also like how easy it is and you can freeze it! Spoon it on pasta, eggs, toast, or wherever you like to pour pasta sauce. For all those Weight Watchers members out there, this recipe is ZERO points. How about that? I love that Weight Watchers made lentils a FREE food because they are so good for you. I have made lentil tacos and mushroom lentil burgers with great success. One of the reasons why lentils are better than your average bean is that they are small so they only take about 15-20 minutes to cook. 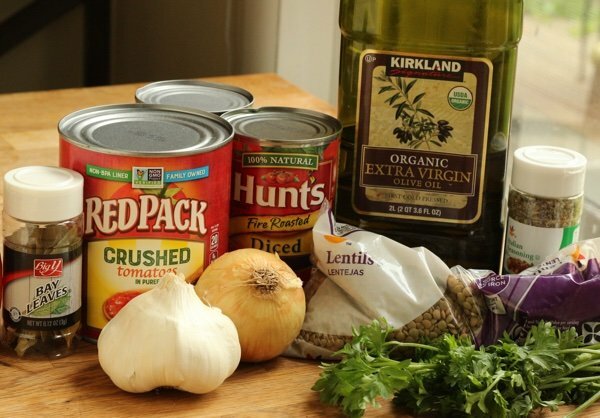 This makes this recipe work because you can reduce and meld the sauce as you cook the lentils. Then you simply toss the lentils in when they are ready. i love them in a curry called dal. I could eat that every day with rice and feel totally satisfied. Dal is something that I order in restaurants but I should make it! What am I waiting for? Do you use lentils instead of beef? What are the recipes that work for you? Heat oil to medium high in a large sauce pan. Saute onion and garlic until translucent about four minutes. Add crushed tomatoes, fire roasted tomatoes, parsley, Italian seasoning, and bay leaves. Bring to a boil and simmer for 30 minutes. 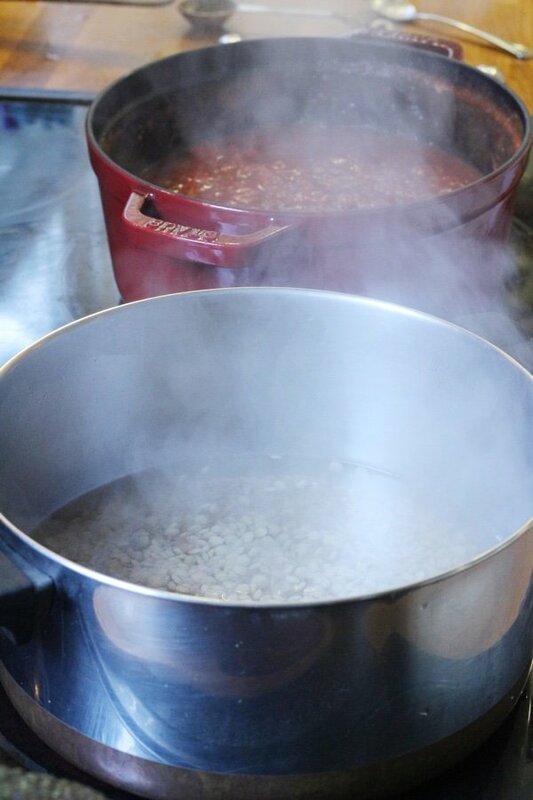 While sauce is cooking, add lentils to a medium sauce pan with 3 cups of water. Bring to a boil, cover, and reduce the heat to a simmer. Simmer for 15-20 minutes until lentils are tender and drain. When sauce is finished cooking mix in cooked lentils and serve. Enjoy over pasta, roast vegetables, or toast. For those of us not following WW Frestyle because it doesn't work for us, I calculated one cup of this this to be 4 WW SmartPoints on my SmartPoints calculator which, thankfully, I saved! I love lentil soup, but only on the first day, before it turns to sludge. If I were making the above sauce, I'd want it to be thinner/saucier. So maybe fewer lentils and some tomato sauce. Great recipe! I was just looking for something to make for dinner and this is it! I've never liked ground beef in sauces but I like lentils go figure. I use lentils in tacos, sloppy joes, "meat" balls and loaf and of course soups and stews. Thanks for these low points vegetarian recipes. I love beans and lentils. They are full of protein, fiber and nutrients and they are so filling. I would add even more fresh veggies to this sauce to make it more colorful but I love the concept. For those who lives near a Trader Joe's, they sell vacuum packed cooked lentils in the produce section. That makes this sauce even easier! Progresso Lentil Soup (2 cans) & I cook up Uncle Bens Rice. Combine as much or little soup together. Then add your Italian grating cheese of any kind. A chicken cutlet or piece of meat on the side is great. Add this over edamame pasta (I just purchased at Costco, but haven’t tried yet) and you have a total 0 Freestyle meal! Thanks for this sauce recipe! Great recipe! It's great over butternut squash or zucchini "noodles". Cooking the lentils in broth...vegetable, chicken or beef....boosts up the flavor. Just watch out for the sodium level in the broth.